It finally feels like winter again! The weather has been so strange. It has felt like Spring or Summer for weeks, but a few days ago it started raining again. I love lazy Sundays when it is cold and rainy outside. It's a perfect excuse to stay in pajamas all day and make soup or other things that need hours on the stove. It is so comforting when the aroma of something simmering on the stove permeates the house. Speaking of comforting, I think that bread could arguably be considered one of the greatest comfort foods of all time. And ever since I read Molly's "Sog Story", I have been enamored of soggy bread. I love panades, but something equally as comforting and less labor intensive is Tuscan Bread and Bean Soup, aka Ribollita. I actually find myself buying extra bread just to keep stale bread on hand. The cubes of bread take on a silken texture when soaked with broth. They become like dumplings in the soup. Completely satisfying. Those Tuscans and their peasant food, a lazy Sunday would not be the same without them. This is just stuff that I had on hand today. Any number of other vegetables and leafy greens can also be used. This is also a great use for Parmesan rinds. I keep leftover Parmesan rinds in a bag in the refrigerator to flavor soups and stocks for making risotto. 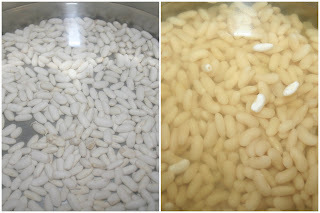 Place the dried beans in a large pot and cover with about 3 inches of water. Leave to soak overnight or bring to a boil, cover, turn the heat off and leave to soak for 1 hour. In a saute pan over medium heat, add about 2 tablespoons of olive oil. 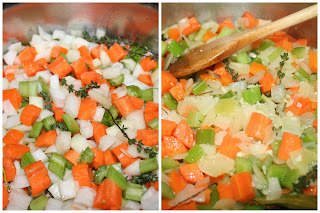 Add the onion, carrots, celery, garlic, thyme, and bay leaves. Saute for about 10 minutes, until the vegetables give off their water and the onions become translucent. Bring the beans to a boil and add the sauteed vegetables and quart of broth. Add the canned tomatoes by crushing them through your fingers into the pot. Add the Parmesan rinds if using. Simmer partially covered for 1-1 1/2 hours, until the beans are soft. Remove the Parmesan rinds, bay leaves and thyme branches. Using a hand held immersion blender, blend for about 5 seconds to partially puree the beans and vegetables. 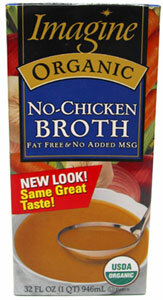 This makes the broth creamy while leaving most of the vegetables and beans intact. It is not necessary to blend the soup but it does give the broth some nice body. Add some salt to taste. Don't add salt until the beans are soft. Adding salt too soon can toughen the skin of the beans and prevent them from softening completely. Add the kale, cover and simmer for about 15 minutes. Taste and correct for salt. Add the bread, cover and simmer another 10 minutes.